When this book came up as being available for review as part of the Page Turners program, I did not request it. Even though I'm Facebook friends with the author, Scott Williams. Even though I'm rather partial to anyone with a last name of Williams. But a book called Church Diversity? How can this apply to me right now? I'm not in charge of anything, I'm not in a position to change anything, and, ummm, well... you know, I'd rather not think about that elephant in the room. I grew up in a church where diversity meant that the Norwegians and the Swedes were willing to mix socially, you know? That isn't a slam of that church... that was a fairly accurate reflection of the community. So this isn't something I've ever really thought about. Um, yeah. Scott Williams. Talking about going out into all the world. Talking about how we need to talk about the elephant in the pew. Quoting the Reverend King, about 11:00 on Sunday being the most segregated hour in Christian America. What an unfortunate reality that many still face today. Have you ever been asked the question, “Is your church a white church or a black church?”…No, it’s God’s Church! This resource is a tool to foster the tough conversations and encourage decision-making to change the face and heart of the Church. There is already a community out there passionate about this topic and moving the Church forward. Hundreds of them uploaded their photos and can be seen throughout the pages of this book. Their twitter names are also included so you can begin connecting with them today! I've been slowly working through this book, which is incredibly well-written. And I am realizing the church diversity is not just up to the leadership in "the church" or even "a church" but it is something that everyone needs to be thinking about. The best part is that although he is a black man, he isn't pointing fingers at white America as being "the" problem. And I realized that was part of my hang-up about reading the book, because I guess I was concerned that I was going to have to wrestle with the idea that everything was the fault of white Christians. Scott certainly is convicting, but he doesn't throw around a lot of blame and guilt. Not only does he give the vision of a church for all nations and all tongues, but he gives a ton of practical stuff too. And it isn't just what worked in his church in Oklahoma. He talks to people from a number of other churches around the nation about their successes in embracing diversity. This is a book that church leaders everywhere ought to read. But it is also a book for every Christian to read. we all need to be a part of the solution here. For more info, check out the Church Diversity website, where you can find out a lot more. Listen to a radio interview. Check out Scott's blog. And look into reading the book. Well worth the time. Hey Debra, I just got a book in the mail from New Leaf Publishing. I have never reviewed for them before, but I found out about them from your reviews! I checked them out, and requested one book. I can't find any info on their site though about when reviews are due, or anything. I was hoping you could give me a little info about reviewing for them. Rodna -- usually there isn't a 'due date' as such. This one was different, as it was part of a blog tour. Debra thanks for your review... As I was writing the book, I was hoping it would be for the body of Christ in general and not just ministry leaders. Thanks for affirming that. Thanks again for reading! Well done! 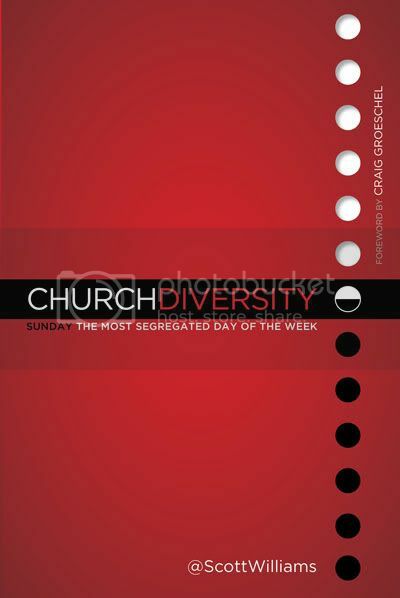 Diversity was one of my favorite things about our church in Woodbridge, VA. It was my first experience living in an area that actually HAD diversity and I loved that it extended into all aspects of my life. I've missed that since we've moved away.